The first multi-class battle royale mobile game–Ride Out Heroes from NetEase Games had finished its Closed Beta Test and grabbed enormous attention. The game will soon be officially launched on both Mobile and PC platforms at the beginning of this May, from March 29th, Android users in South East Asia and Latin America can go to Google Play Store and search “Ride Out Heroes” or click here to pre-register the game. Player who pre-registers will be the early adopter to try the game and be rewarded an awesome gift package(worth over $10!) once it comes out in May, 2019. 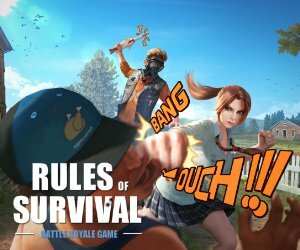 Developed by the same team of Rules of Survival, Ride Out Heroes is a 100-player multi-class battle royale game that allows you to battle in both solo and team-based matches and survive till the end. But unlike other battle royale game, it features players can choose heroes from multiple characters. Five heroes are available for the first release and each of them has unique character traits, epic weapons and five different abilities. For instance, players can get assassin-oriented character Hasan who feature quick and devastating attacks or shooting-oriented character Robin Hood who could fire dazing arrows to make remote damage. Players can have their preferred combination of maximum two unique skills and choose their own strategy to team up and knock down the enemies. Revival after KO is another distinct feature that separates Ride Out Heroes from its competitors and brings excitement along with tension. Player who has been “knocked down” will be transformed into a baby dragon. If the baby dragon survives from the attack in the following 30 seconds, it will return to the battleground in the form of the hero. Being a baby dragon, players could further choose to transform into props like barrel, shrub, box, and light to disguise and hide from enemies’ attack. In addition, innovative mechanics like the Mount System and Random Sanctuary System are also available in Ride Out Heroes. By a simple click, players could summon a mount, which could be a dinosaur, bird or sled dog, to speed up and get rid of the storm. Sanctuary will randomly show up on the map where players could “wish” to forge epic weapons, abilities, armors or potion that can not be obtained by looting. Watch out and prepare for the intense sneak attack by enemies when waiting for the epic weapons to be finished! Unlike other realistic battle royale game, magical 3D design is employed to depict a wonderland within Ride Out Heroes. Different spots like fairy forest, dessert or cities full of awe-inspiring vegetation and landscapes are open to be explored. Rich scenery will render diverse battle experience for players. If you are a fan of Battle Royale, MOBA or 3D RPG game then you will find out lots of entertainment in Ride Out Heroes. You can pre-register here and keep up with the latest news on its official Facebook page.